A bullying incident in Fort Bonifacio High School (FBHS) that was caught on camera has gone viral over the Internet the past few days. In the 34 second clip, Abigail Dalundon can be seen being slapped and physically attacked by a group of female students (they have a male companion). Also in the video, an onlooker can be also heard saying “huwag niyong pagtulungan” repeatedly to the attackers. 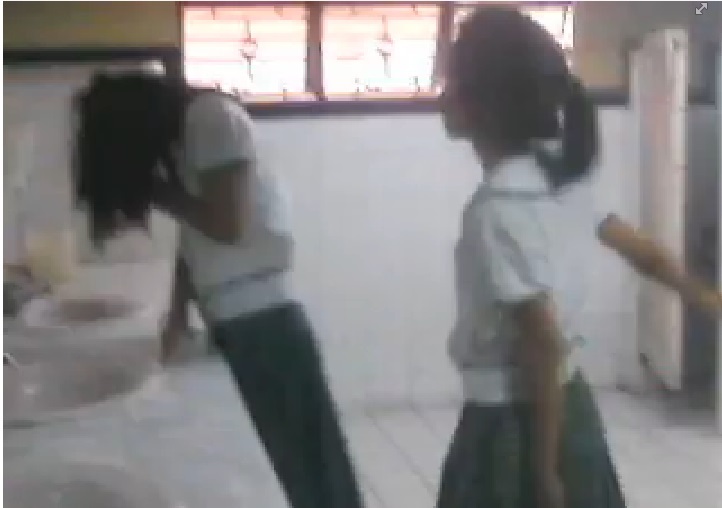 The incident transpired in the school’s wash room. The video, which has originally been shared in Facebook last July 20, has now been shared almost 40,000 times. Watch it in this link. Here’s what happened according to Hitomi Dalundon, the victim’s sister and the original uploader of the video. Ako po si HITOMI kapatid ni ABIGAIL DALUNDON. nung JULY 17, 2013 sa CR ng pambabae FORTH BONIFACIO HIGH SCHOOL! Si ANDREA yung babaeng sumampal sa kapatid ko sa video na toh. Siya rin daw yung laging nag aaya sa kapatid ko na MAG CUTTING sa klase. Sa takot ng kapatid kong si ABIGAIL dahil pinagmamali ni ANDREA na kasali siya sa PRAT. Dahil binantaan ni ANDREA na sasapukin, ipapabugbog daw at aabangan sa labas ng schoolL…. Sinabi daw ni ANDREA na pag di daw nag cutting si ABIGAIL ippabugbog daw siya sa labas ng school. Sabi din ng ibang estudyante na si ANDREA daw ang pinaka matapang sa loob ng class room nila. Dahil si ANDREA ay kasali daw sa PRATERNITY SA LOOB NG SCHOOL!!! SANA MAS IPURSIGE PA PO NILA YUNG BATAS NA ANTI BULLYING..